Large (12-14) - £44.99 Only 7 left! If you are an independent lady with a fiery personality then you probably resonate with the most independent of Disney Princesses, the one and only, Jasmine. You and your ferocious pal and pet, Rajah, will have a night you won’t soon forget dressed in our Adult Jasmine Costume. If for some crazy reason you don’t have your own tamed pet tiger hopefully you’ve got a dog or cat....it's basically the same thing, right? Princess Jasmine has always been one of the most alluring Disney Princesses in history and for good reason. Her beautiful blue and gold wardrobe is one that screams Arabian royalty and finally you can get the same look. 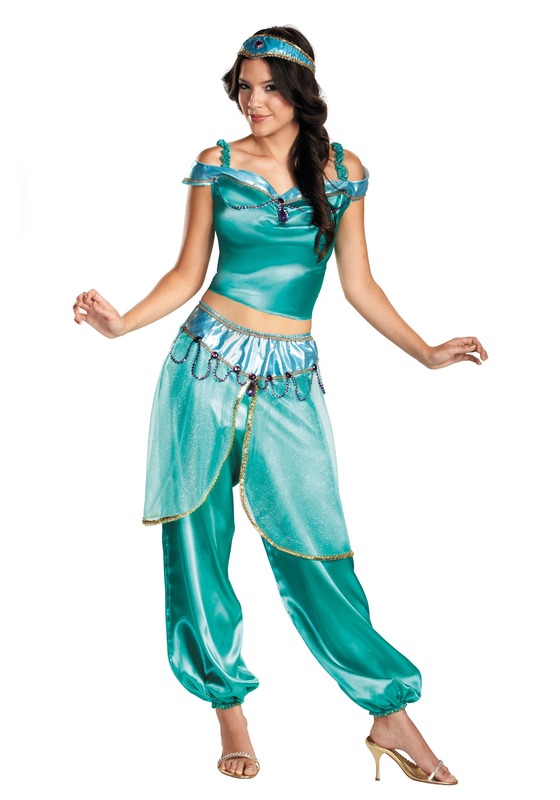 Our Adult Princess Jasmine Costume will have you looking as if you just broke out of the castle walls wearing the teal satin midriff top and perfectly baggy parachute pants. Add strappy sandals or a sparkly pair of heels to complete this exotic Arabian Nights-inspired look, and you'll look ready for a magic carpet ride in the clouds. Get ready to rule over Agrabah in this Adult Jasmine Costume, and explore a whole new world with your own Aladdin! You our exotic Disney princess are sure to be exposed to a whole new world, so be prepared! King Sultan is just going to have to loosen the reigns and let you do your thing. So get out there Jasmine, and enjoy your magical Arabian night!